Every couple years or so I return to a book I have owned for a while now: “Care of the Soul: A Guide for Cultivating Depth and Sacredness in Everyday Life”, by Thomas Moore. I always find things in there that directly apply to my life and shed some light on whatever it is I am wrestling with at the time. This time I got caught (pleasantly) in the chapter entitled, “The Myth of Family and Childhood.” In it, Moore writes about the archetypal family, and searches for the “myths in the ordinary roles of family life.” The phrase that really got me thinking was this: “In many traditional cultures a person becomes an adult by hearing the secret stories of the community…” The phrase struck me because it just so happens that I turned 40 last month and for my 40th birthday I asked each of my parents to tell me the story of their divorce. I faced a lot of emotions hearing these stories. At times I felt shocked to learn things that had been hidden from me all these years. Other times I felt comforted, that my perspective and interpretation and memories were validated. When I was in the thick of processing these stories the whole thing felt huge, like a giant dark wet blanket thrown over me. It was hard to see my way out, and I was wrapped up in my self. But then I got reading Moore’s chapter about family archetypes and myth and I was able to see my story reflected back in the ancient myths that tell the old, eternal human stories. 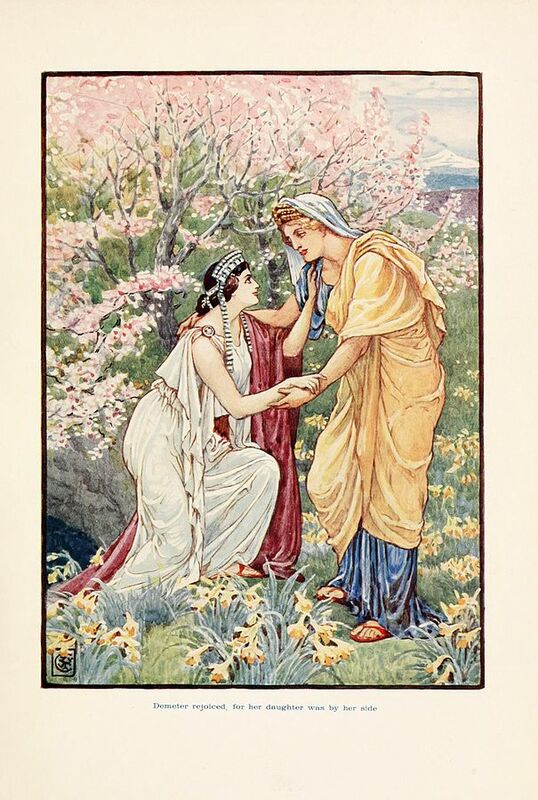 Odysseus, Persephone, Demeter. The giant dark wet blanket began to lift as I began to see that my experience, my story, which felt so raw and personal was actually just another telling of the most ancient human stories. The details are different, but the patterns are the same: the patterns of a human life. Here I was groaning and moaning about my story when – get this – my story means that I am human! For many years I have been wanting to write a memoir of my time living in Mexico and the turbulent relationship I was involved in there. But the whole thing has remained so murky that I couldn’t even begin to see any clarity about what I would write. Finally, as I begin to study ancient myths, I see a framework for my story. And most importantly I see that I am not alone. This path I am on is well worn. There is comfort in that. When we tell our stories, we have an opportunity to connect with our brothers and sisters, our mothers, and fathers, our human family. What better way to remember that we are not alone? Let’s keep walking this path together, friends.